It’s hard to know where you fall on the meter stick without competing. That said, after the winter offseason, Florida State potentially lines up a lot differently than in the fall. Two more players might have just entered the spring conversation. When the fall season ended, junior Greyson Porter and redshirt junior Jonathan Keppler knew there was a lot of room for personal growth. Porter posted the fifth-lowest scoring average on the team after two tournament starts, and Keppler didn’t made a start at all in the first half of the season. Over winter break, a semester of hard work – tough phone calls, a new way of looking at the game, a series of short-term goals – caught up with each player. Keppler and Porter made leaps in the right direction with a major amateur tournament victory apiece. Keppler ended 2018 with a come-from-behind effort and ultimately a playoff win at the Dixie Amateur. 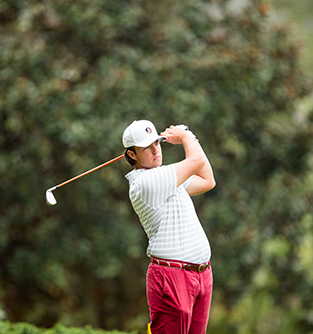 Porter simply outplayed the field for three days to win the Orlando International Amateur. “I can tell you that the other players on the team were ecstatic for them because they had seen how hard they had worked,” Florida State head coach Trey Jones said of those breakthroughs. For Keppler, a natural instinct to please made it easy to put pressure on himself to win. When the team did skills challenges, Jones said, Keppler was always the winner. It was just a matter of taking that to the course. Keppler, at his coaches’ urging, began work with Bhrett McCabe, a clinical and sports psychologist who works with a handful of PGA Tour and LPGA players. It was game-changing. As for Porter, a lack of consistency made it hard to contribute to the team in a big way, so he changed swing instructors in search of a new voice. As Jones points out, it’s a move often made by Tour players, but can be much harder for a younger player to follow through with. The player-coach relationship is thick. “It can be difficult for a young player to make that phone call,” Jones said. At the Orlando International Amateur, Porter won with rounds of 63-64-68 at Orange County National. The next week, he was in the top 5 at the New Year’s Invitational. “After awhile, I knew something would click,” Porter said of his recent work with Denny Lucas, a Jupiter, Fla.-based instructor. It happened in Orlando. The road that Porter and Keppler walked to get back to the highest level of the game reflects the culture of Jones’ program. Players go there and get better, which is a most sought-after trait in college athletic programs, no matter the sport. Part of that culture comes from the goal-setting that Jones encourages. Part of it is the coaching staff, and part of it is just the way business is done. But the players have to commit, too. So understandably, it’s not just about getting back in the lineup. It’s about getting back to winning. There’s a particular fire inside Florida State players this season. Before the 2017-18 season, Florida State had advanced to the national championship for the past six years in a row. It was an ACC-leading streak – and tied for the fifth-longest active streak nationally – but it ended in May when the Seminoles came up a shot short of advancing out of the regional in Norman, Okla. It has been a bit of an odd season in Tallahassee as the Don Veller Seminole Golf Course undergoes a renovation at the hands of the Jack Nicklaus Design firm (Nicklaus himself was on property earlier this month). The team has been displaced by the dirt moving, but in a town like Tallahassee, as Jones pointed out, Seminoles are everywhere and doors are always open. Jones hasn’t heard a single complaint from a player. All they have to do is look at a bulldozer to be reminded what’s coming. Periodically Florida State players have even been asked to hit shots on the course to help map out holes. In that way, the new track will carry their fingerprints. It will carry Jones’ fingerprints, too. The veteran coach has been tapped for ideas on the project, often spending hours on site answering questions. Working hard and leaving a legacy comes from the top down in Tallahassee. On Sunday, @jacknicklaus and his design team paid another visit to Seminole Golf Course. BACK ON FAMILIAR TURF: Ashleigh Albrecht-Hatton isn’t anywhere close to being a Sebring, Fla., local, but when you have past-champion status at the Harder Hall Invitational, you might as well be. She is as close to the locals’ hearts as this small-town tournament is to hers. Albrecht-Hatton won this event back in 2011 when she was in the middle of her sophomore season at Kentucky. The Murrieta, Calif., native embraced the local charm of an event where many of the past champions have found success on the LPGA tour. After chasing tour life for six years, Albrecht-Hatton decided to seek reinstatement as an amateur. It was an easy decision where she’d relaunch her amateur career. After her Harder Hall win, locals threw her a party. They always followed Florida college events and Symetra events, and even drove to Daytona Beach, Fla., to watch her compete at Q-School. For Albrecht-Hatton, returning to amateur golf was a move largely forced by injury and the pain caused by three cysts on her back plus degenerative discs. She took a total break from the sport for a year and a half starting in the summer of 2017, but the competitive itch never went away. She officially was reinstated at the end of November, started hitting golf balls in December, and the Harder Hall marked her first competitive start. Albrecht-Hatton was finished in the top 20. The 28-year-old married Wesley Hatton five months ago, a former baseball player drafted out of high school by the Los Angeles Angels. The two lived a very similar story. Wesley works as a real estate agent after injury drove him from the sport he loved, too. These days, Albrecht-Hatton is pursuing her masters in teaching, with an interest in kindergarten through third grade. She also applied to a handful of coaching positions. Mostly, though, she’s looking forward to a possible U.S. Women’s Mid-Amateur start, in addition to U.S. Women’s Open qualifying and any other women’s amateur events that fit her schedule. She’s starting slow, and joked about feeling like the old lady at the Harder Hall. Then again, the field often skews young. ANOTHER PAIR TO THE PROS: It’s no secret that Australian Min Woo Lee had eyes on professional golf. Last month, he was one of three amateurs to advance to the final stage of Web.com Tour Qualifying, even though he ultimately fell short of any kind of status. Lee has announced that he will take the plunge this week, even without status on a professional tour. According to Golf Australia, Lee hopes to secure exemptions early on the European Tour schedule and will make his professional debut at this week’s Abu Dhabi HSBC Championship. Lee, whose older sister Minjee Lee is an LPGA tour winner, will walk away ranked No. 5 in the World Amateur Golf Ranking, the highest Australian. Lee twice contended at the Asia-Pacific Amateur, finishing T-16 in 2018 and T-3 in 2017. Along with Lee, another notable amateur – whose name became known after winning the Asia-Pacific – has also announced he will turn pro. Golfweek reports that Cheng Jin, the 2015 Asia-Pacific champion who played the 2016 Masters, will forego his junior season at USC in favor of turning professional. This also comes as no surprise considering the success Jin has experienced professionally. He won PGA Tour China’s Nine Dragons Open in 2014 to become that tour’s youngest champion at age 16. He also scored a 17-shot victory at PGA Tour China Q-School last spring, leaving the chance of even starting his junior season up in the air. CANADIAN CLASS OF 2019: Two new individuals will enter the Canadian Golf Hall of Fame in 2019, and both have deep ties to amateur golf. Rod Spittle has had a standout amateur career while Herb Page was a legendary college coach at Kent State. Spittle’s amateur career began with a runner-up at the 1973 Canadian Junior and a win at the 1977 and 1978 Canadian Men’s Amateur Championships while playing Division I golf at Ohio State. He won a pair of Columbus (Ohio) District Amateur Championships (1989 and 1987) and three Columbus (Ohio) District Mid-Amateur titles (1994, 1995 and 1997). He went on to claim the Ohio Mid-Am Championship three times (2000, 2001 and 2003) prior to turning professional in 2004, shortly before turning 50. Page has been a fixture on the Kent State University campus since arriving as an undergraduate three-sport student-athlete (golf, football and hockey) in 1970. Nearly 50 years later, now the university's director of golf, Page has grown to become one of the most respected golf coaches in the world. He was inducted into the Canadian Golf Hall of Fame’s builder category, and is the first coach to enter it. TIME TO LOOK AT YOUR CALENDAR: The USGA began rolling out qualifying sites for its 2019 championships this past week. As of this week, the USGA has listed on this page a “sneak peek” of qualifying sites for various championships including the U.S. Senior Women’s Open, U.S. Women’s Open, U.S. Open, U.S. Senior Open, U.S. Junior, U.S. Girls’ Junior, U.S. Women’s Amateur, U.S. Amateur, U.S. Senior Women’s Amateur, U.S. Senior Amateur, U.S. Women’s Mid-Amateur. Qualifying is already underway for the U.S. Amateur Four-Ball and Women’s Amateur Four-Ball, of course, which are slated for late May. The skinny: The national championship for Australians. The list of past champions is distinguished, including LPGA winners Minjee Lee and Lydia Ko on the women’s side and professionals Cameron Smith and Matt Stieger on the men’s side. The format mirrors that of USGA amateur events, with 36 holes of stroke-play qualifying followed by a 64-player match-play bracket. Women’s South Atlantic Amateur (the Sally), Jan. 16-19, Oceanside CC, Ormond Beach, Fla. The skinny: The next stop on the Florida Orange Blossom Circuit. The history is deep at Oceanside, and titles are not easy to come by thanks to a strong, biting wind that blows in off the Atlantic Ocean across the street. The skinny: The LAAC represents the last opportunity for an amateur to qualify for the 2019 Masters Tournament. The 72-hole event is grueling, considering how much is on the line. AmateurGolf.com will be on site all week, so stay tuned for updates.